What Would The Lean Startup Look Like For Nonprofits? - Lean Startup Co.
What Would The Lean Startup Look Like For Nonprofits? This post originally appeared on Sasha Dichter’s blog. I think of Eric Ries’ book, The Lean Startup, as an innovation handbook. Eric, a software engineer turned successful entrepreneur, sets out to dispel myths around innovation and entrepreneurship. He unpacks what it actually takes to innovate in the real world. Part 1: entrepreneur (and a couple of friends) have a revolutionary idea. They pull all-nighters in the proverbial garage, write a bunch of code, and the idea comes to life. Part 2: “photo montage” that lasts about two minutes long while they actually build the company. Part 3: entrepreneurs fight over how to distribute the spoils. The Lean Startup is all about Part 2, the actual work of figuring out if the thing you’re building is of any value to your customers. Eric’s main premise, based on his own experience as a serial entrepreneur, is that most innovators and their teams waste huge amounts of time because they prioritize getting work done over figuring out what their customers want. In Eric’s case, as the CTO of a software company called IMVU (which lets you make cool online avatars), he spent six months killing himself writing 25,000 lines of code. The catch was that when IMVU put the software in front of 16 year old kids (their customers) they discovered that a core functionality of the software that had taken six months to develop – that it worked with every major instant messaging platform – was absolutely useless to the 16-year-olds. Six months of work totally wasted because the team wasn’t willing to test their assumptions at the beginning. Six months building functionality when they could have built a webpage in one day and gotten the same answer. 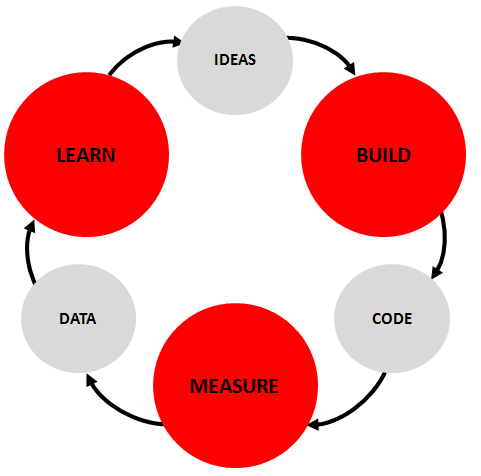 By embracing a Lean Startup mindset, you build products in a completely different way. Your early products’ only job is to allow you to test your assumptions; you do this by MEASURING results that validate or reject these assumptions; and you LEARN from these results, and either pivot your company strategy to a new direction or continue on course. The big point of the giant chart (the whole point of the book really) is: the main determinant of whether / how quickly we innovate is how quickly we can go through the BUILD – MEASURE – LEARN cycle. The faster we go, the more quickly we learn, the more often we pivot, the less time we waste. We optimize for learning and build organizations that are made to adapt quickly. Makes sense, but it’s not how we (any of us) act most of the time. And this is where the lightbulb went off for me about the social sector. It’s never felt to me like we are, by and large, built for innovation, yet that always felt like it had to do with willingness to take risk – especially on the part of the big institutional players. And while there’s some truth to this critique, it also partially misses the mark. 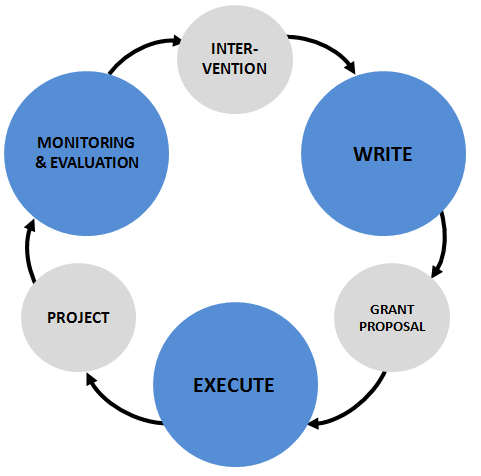 The lightbulb moment for me is that we are structured as a sector to have a BUILD – MEASURE – LEARN cycle that lasts three years (sometimes longer)…the time it takes to get a grant, execute against that grant, write the grant report during and after the grant, and potentially renew. So the underlying problem isn’t about willingness to take risk, the underlying problem is the false premise that long cycle times make sense – when in fact as a sector we need new and better solutions nearly everywhere and need to create engines of innovation to get us there. Our sector conducts itself with an academic approach to learning – with all of the rigor and the long, slow cycle times that always entails. Of course there’s amazing work going on nearly everywhere, people bucking the system, working around the barriers, making incredible things happen despite the structure being all wrong. But what would a world look like in which we acknowledged that we don’t have all the answers? What would it look like if we asked ourselves NOT to be right from the get-go but instead to create approaches and systems that are designed from the outset to incorporate learning quickly? I think it would look pretty different from what we’ve got today. I think that business approaches would be a bigger part of the answer not because it’s inherently better when people pay for things but because businesses are designed with built-in feedback loops from customers. I think that providers of capital would feel more like long-term partners and no one would survive who didn’t learn quickly and adapt often. I think we’d listen to end customers a lot more and treat experts less like experts and more like people with accumulated experience from which we can all learn. What else would a Lean Nonprofit sector look like to you?